Kabam have delivered their August update to Transformers: Forged to Fight players, and we have a very nice addition to the ranks: G1 Wheeljack. You will be able to add Wheeljack to your ranks of playable characters from August 9th at 10.00 AM PDT. This time, Wheeljack is coming in a design similar to his Masterpiece incarnation that will sure please the fans . Sega’s YouTube Channel have uploaded the new Sega’s Transformers: Shadows Rising Arcade Game Trailer. This game, which we had reported some time ago, is the long-awaited follow up to the smash hit licensed video game Transformers Human Alliance. 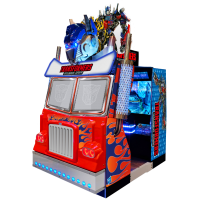 Packed with tons of action, movie characters and an awesome cabinet, we are sure it will place both gamers and Transfans. You can check some gameplay one this post. Not much left to say, you can check out the trailer below and the chime in your impressions on the 2005 Boards! Via an update from the official Transformers: Earth Wars Facebook and Instagram account we have a nice update to share with all players of this popular mobile game. From a limited time starting this Friday, you can collect characters with special power cores that make them look with a cool G1 and 80’s inspired design. You can check out the promotional video below (with a tune we are sure you will love) and then you can join to the ongoing discussion on the 2005 Boards! Relive the 80s with these classic bots in Transformers: Earth Wars, starting this Friday! Get ready to play! Finally, after their official announcement in March, we have an interesting update on the upcoming Transformers: Shadows Rising Arcade Game By Sega. “The action-packed gameplay takes place across three unique locations on Earth, and there is even a mission on the moon. All the action unfolds on a 55” Full HD monitor, at 60 frames per second thus delivering a crisp video. Set in a theatre cabinet with four speakers and subwoofer the whole experience is immersive and thrilling. As well as the fixed controllers, players can use the brand new ‘Hyperenergy Tech’ lever to either tactically destroy multiple enemies at once or defend against difficult enemy attack moves”. Arcade Heroes have also uploaded a short gameplay video on their YouTube channel from previous Amusement Expo 2018 event. Tons of action and non-stop shooting, great battles and characters from all the live-action movies. You can check the video below, but remember this is not the complete game yet. You can also read the full press release with images of the new cabinet and some screencaps after the jump. Then, you can sound off on the 2005 Boards! Kabam have delivered their June update to Transformers: Forged to Fight players, and we have a very nice addition to the ranks: G1 Jazz. You will be able to add Jazz to your ranks of playable characters from June 7th at 10.00 AM PDT. The design is very faithful to the G1 look, specially in alt mode. The robot mode looks great and makes you think it is the design of a real toy. Via the official Transformers Earth Wars Facebook, they have shared a video to celebrate the second anniversary of this popular mobile game. This real-time combat strategy mobile game created by Space Ape Games/Backflip Studios brought a big cast of G1 characters, and it has been expanding constantly with other characters from the rich multiverse. With a story by the legendary Simon Furman, players have spent 2 years of battles, campaigns, alliances, combiners and formed a great community around this game. It has been 2 years, but the war continues. You can check out the video below and then sound off on the 2005 Boards! Today we're celebrating 2 years of Transformers: Earth Wars! A huge thank you goes out to our community of players. Kabam have delivered their May update to Transformers: Forged to Fight players, and we have a very nice addition to the ranks: Beast Wars Transmetal Cheetor. You will be able to add Cheetor to your ranks of playable characters from May 10th at 10.00 AM PDT. We are sure you will really like his design for the game, very faithful to the Beast Wars Cartoon, but with some new elements. The official Forged To Fight Facebook has also shared a video to introduce Cheetor. We have mirrored it below. Time for this cat to POUNCE! Following our reveal last week of new combiners available in game, we are pleased to share with you a video of Deborah and Josh from Space Ape Games demonstrating the abilities available for Victorion and Menasor. In this clip we see: each combiner assemble, Victorion’s blade dash, Menasor’s kinetic barrier and Victorion’s noble sacrifice (which for Menasor is internal conflict). Remember to download the game for free from your app stores & then join in the discussion on the 2005 boards! Kabam have delivered their April update to Transformers: Forged to Fight players, and we have a very nice addition to the ranks: G1 Blaster. You will be able to add Blaster to your ranks of playable characters from April 12th at 10.00 AM PDT. We are sure you will really like his new design for the game, which has got element of his Titans Return incarnation. The official Forged To Fight Facebook has also shared a video to introduce Blaster. We have mirrored it below. The full Bot Intel Report with can be found here at the official Forged To Fight website. You can also read on for the full profile and stats after the jump and then join to the discussion at the 2005 Boards! Now to inject a little feedback.